Do you dream of a lazy stroll down the street casually holding your pup’s leash in one hand and a cool libation in the other? Although loose leash dog walking may seem like a wild-eyed fantasy, I assure you, it is entirely possible. Even for your dog. When I first got my little sweet paws, she was about six months old and already had some pretty bad habits. Determined not to become besties with a shoulder surgeon, I researched and tested techniques for loose leash dog walking with a vengeance. Luckily for you, I studied, so you don’t have to. Here are some tips on how to revoke your dog’s tow truck license. Loose leash dog walking doesn’t just happen overnight like a visit from the Tooth Fairy. It requires diligent training. Your mileage may vary, but if you work with your pup consistently every day for a week, you’ll have a good start. This, however, means that that week will be a total buzz-kill for you. For the quickest and most reliable results, you’ll need to use these techniques every single time you walk your dog. Otherwise, your pooch won’t know whether it’s your turn to be in charge or his. If your dog is a puppy, he may catch on more quickly but you can definitely teach an old cur new tricks. For a new puppy, you may also want to check out these puppy training secrets at theonlinedogtrainer.com. 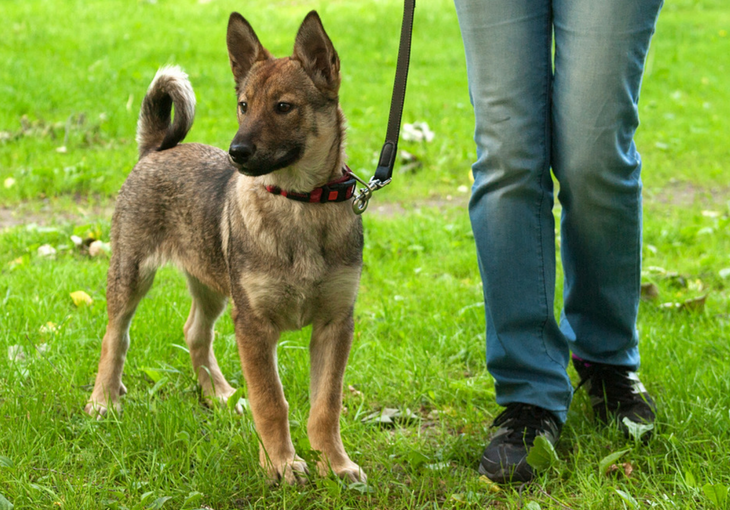 It is crucial to use a fixed-length leash when teaching loose leash dog walking. With retractable leashes, your little rambler will not know just how far he can roam. The article Dog Leashes 101: Finding the Best Leash for Your Dog will help you find a great one. Leash, that is, not Beagle. PRO TIP: Depending on the size of your pooch, a four to six foot leash is usually about right. Shoot for a length that allows your pup to stand about two lengths of his body away from you. That’s short enough to rein him in quickly and long enough that you’re less likely to trip over him or the leash. If you are like a dog with a bone with the suggestions in this article, you may be able to spend your cash on a trip to the Bahamas instead of pricey equipment. Yet, no matter how dedicated you are to the process, some dogs just may not ‘get it.’ If your pup is in that category, humane equipment, such as halters or harnesses, are fallback options. But know that, when you teach your pal to walk on a loose leash using an aid, your physical signals may feel differently to him. To get a loose leash, you may always need to use the equipment to get a laid-back walk. If equipment seems to be the only solution, there are a number of humane equipment options out there. Check out this article on humane equipment solutions for tips. PRO TIP: Do not use choker collars, pronged collars or anything else designed to influence your dog through variable neck pressure. When you want your guy to have a loose leash, these devices confuse the issue. There’s also a proven risk of injury…or death…with these items. Consistency is key. When you begin training, everyone on Dozer’s walking team needs to follow the same rules and use the same commands. Huddle the family and settle on your course of action. Discuss the importance of working as a team to support your guy’s success. Be sure to mention the long-term ramifications of paying for college versus shoulder surgery. When my girl and I were in puppy class, they prescribed the commands. I dutifully used the terms they dispensed. But, I had a struggle with some because they were not my natural way of speaking. For example, my pup’s official command for a loose leash is, cleverly, “Loose Leash.” At first, that phrase sounds all fine and good, but who really says that? My sweetie is clever, so she’s figured out that “don’t pull” equals “loose leash.” But if you choose terms that work for you from the get-go, you can skip this extra step. The terms mention throughout this article are the ones I use. Pick ones that would automatically come to your mind…not mine. One to two word commands are usually best. More than that is harder for you to say and for your pup to understand. Your dog’s DNA contains thousands of years of genetic programming that makes him instinctively want to please you. You just have to show him how. The trouble is that we humans, on the other hand, spent those same thousands of years on more important things, like creating beer pong. Now, we’ve got to catch up on our communications skills. As pack animals, dogs crave a benevolent leader. To clarify, shouting, hitting, jerking or any other jerk-like behavior are not benevolent and are counter-productive. No one, man nor beast, wants to voluntarily please someone they disdain. Plus, since we haven’t really learned to speak fluent dog, they won’t know what, exactly, they’re doing wrong. “I’m going as fast as I can!” they think. “Do you want me to go faster? You do seem to be dragging a bit more than usual today. On the other hand, if you speak calmly, hold yourself with confidence (even if you have to fake it) and walk with authority, your dog will be less likely to wonder whether you need a bit of guidance and a tow. Beginning your training indoors, where there are fewer distractions, will make your practice sessions less challenging for you both. Try to start your loose leash work in a place that is just downright boring for your fellow who is 98% nose. If your home is small, try your garage, back yard or an empty parking lot. The fewer new smells the better. Training your dog is most effective when both of you are having a good time. Anger, or even resignation, may confuse him. “If I’m doing it right, then why isn’t my person happy?” he may wonder. Don’t skip the exercise because you’re not in the mood. But do try to buck up and enjoy the ride. Keep the exercises brief. Stop before your pup loses interest. Leave him wanting more so he’ll be excited about the next session. You are the leader. So, you exit the house first. As the two of you are preparing to leave the house, first attach the leash. Then, have your sweet snout sit by the door and stay. For guidance on how to teach your dog to sit, check out this article on How to Tech Your Dog Basic Commands. Stand between the pup and the door and open the door very slowly. If he jumps up, as he probably will, close the door and sit him back down or walk into his space to guide him back from the door. Don’t kick, shove, hit or shout, this isn’t what another dog would do, so it won’t make much sense to him. Repeat this Mind the Door maneuver until you get the door open wide enough for you to slip through. Go through the door slowly. Then, turn and calmly release your dog from the sit/stay using your release command, something like “OK” or “Walk,” and begin your walk. Follow Me is an exercise that can be fun for both you and your pup. Think of it as a combination of tag and keep away. Attach your dog’s leash and hold onto the human end. Slap your thigh and, in an enthusiastic voice say,“Come on!” (or whatever works for you). Walk or run away from your pup (still holding the leash but keeping it loose) while calling him enthusiastically and slapping your thigh. After you’ve gone a few yards or just as the leash is about to be taut, turn in another direction and call him to follow you again. Tell him he’s great every time he shifts course to follow you. The object of this game is that he doesn’t know which way you’ll turn next so he has to keep a close eye on your movements. At the end of the game, give him double helpings of praise and maybe a few treats. But remember, only reward good behavior. This game is easier than it sounds. Check out these videos to see it in action. This is where you’ll need to shore up your patience. In this exercise, you will teach your fur-footed friend exactly what you want. After getting out of the house (see Mind the Door above), begin your walk. If your pooch is like most, he’ll immediately bolt ahead of you to get the show on the road. Your loose leash dog walking instruction begins now. Hold the leash steady until he quits straining. Do not add pressure by pulling back or tugging from your end. Eventually, your dog will step backward, sit down, sniff something a little closer to you or do something else to reduce the strain…it’s all good…just as long as the leash loosens. Once the leash has the slightest bit of slack, say something like, “Good boy. Walk.” and simultaneously resume your walk. The instant he reaches the end of the leash and pulls again, say “Stop” as you stop abruptly. Again, do not tug on the leash, just stop. Repeat this process every time you move forward. The first day, you’ll do this about a gazillion thousand million times before you turn around to head home and you may not make it very far at all. But don’t stop training as you head back. This practice is a round-trip adventure. Do the same thing the next time you walk, and the time after that. Each time, your pup will get better because he will learn that a loose leash earns him the reward of moving forward. To help him learn this quickly, you must be consistent. Otherwise, you’re teaching him that pulling only sometimes means stopping…or does it mean that at all? If you don’t waiver, before you know it, this method will pay off. PRO TIP: During Pull Means Stop, if your goal is to have your pup walk by your side and your dog is food-oriented, keep a treat in your hand and your hand about the same height as his nose (unless he’s a Chihuahua). Occasionally, open your hand, say your term for the action, for example “Heel,” and give him a treat as you continue walking. If you would like for him to learn to walk on a specific side, be sure to always keep the treat on that side. The exercises mentioned in this article don’t require treats, just enthusiasm. Still, with snack-happy pups, something tasty may come in handy. The secret to keeping your pup from becoming a well-trained bowling ball is to just hand out the tiniest little bit of treat to reward good behavior. Dogs don’t equate a large treat with a large success. I won’t kid you. Loose leash dog walking does take a bit of effort to establish. But a few weeks of effort, will mean years of terrific adventures with your best friend. So, shoulders back, head up and tally ho!